before Christmas, and not only do you get one of the sharpest screens in the business, you also get 12 months of Sky Q and the Original bundle included, to enjoy the widest range of entertainment in Ultra HD. This is LG's finest 4K screen, providing the deepest blacks and richest colours across some 8 million pixels, plus a selection of eye-popping ultra high-definition content to watch on it, from channels such as Sky Atlantic, Sky 1, Dave, MTV, Fox and Syfy. 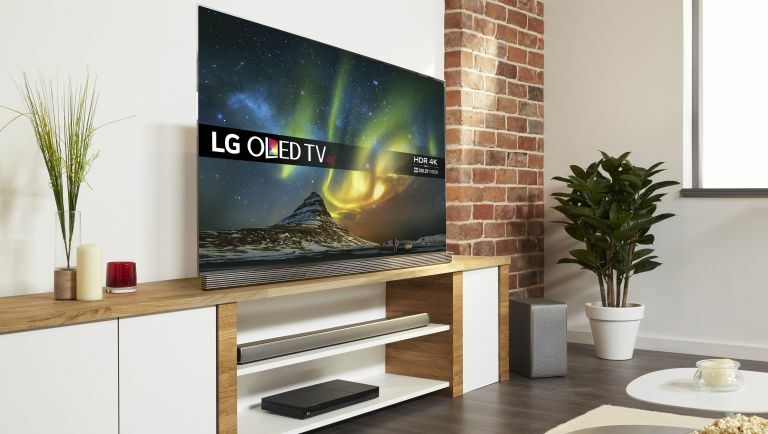 LG calls its latest range "a whole new category of television" where perfect black creates perfect colour, and Dolby Vision HDR technology (with enhanced colour and contrast) brings a cinema-style experience to your living room. To sweeten the deal there's superior sound designed by experts Harman / Kardon. All LG OLED 4K TVs feature a sleek, stylish design, including the C6 model – exclusive to Currys PC World – which is available in 55-inch or 65-inch screen sizes and features a gently curved design for an immersive viewing experience. Currys also includes a 5 year guarantee on all LG OLED 4K TVs. Unused pixels switch off to give you the deepest blacks possible, matched with vibrant colours that are perfectly tuned and balanced for a gorgeous overall picture. Thanks to the organic light-emitting-diode technology, the pixels on these sets can move a thousand times faster than traditional LED screens - perfect for sports and movies, even at the highest 4K resolutions. Besides the channels we've mentioned (plus many more), Sky Q gives you 2TB of recording capacity for storing shows, the ability to watch in multiple rooms, and the option to continue your viewing on mobile devices. You can enjoy 4K picture quality on selected events and shows, such as over 70 movies on demand, more than 30 hours of incredible documentary footage and 124 Premier League matches. It's a next-generation television setup to go with your next-generation LG OLED 4K TV. The 12 month Sky Q offer is running until March 2017. If you're an existing Sky subscriber then you'll be upgraded to the Sky Q deal for no extra charge. The LG OLED 4K TV range, including the B6, C6, E6 and G6, has to be seen to be believed. Check out the range now at currys.co.uk and find your nearest Currys PC World store to see them for yourself.